Located in Saigon Center, Bui Vien Miss Home is a wonderful destination for any traveler favorite explore a new culture. 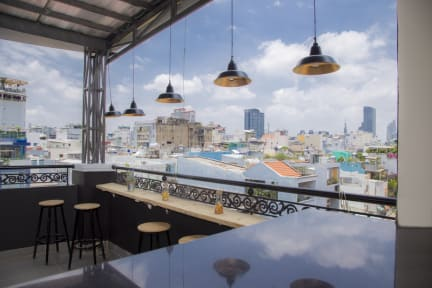 The house stays in an alleyway with some Vietnamese restaurants next to but so quiet, especially in here with a rooftop, that place you can relax with a perfect view all the Ho Chi Minh city. Bui Vien Miss Home is the best kind for any traveler wanna choose a good stay. Please come to our hostel let we serve you best. We loved our stay here! The rooftop patio was lovely and David was so kind and helpful! They are Vietnamese brothers working together and they are awesome! Had a really nice stay here for 4 nights. All of the staff are naturally friendly and very helpful, they made us feel completely welcome. The site is clean and the rooftop is great for relaxing and eating free breakfast. Everything works fine in the room including fridge, tv, shower etc. Staff helped us book Mekong Delta tour for us also. Overall very happy with stay here, if you are looking for relaxed and comfortable stay in Vietnam this is definitely the place in Ho Cho Minh, excellent value. 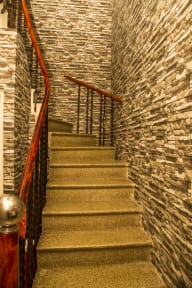 Perfect location right in the heart of backpackers quarters in Saigon. Quiet in the rooms but still really close to everything. Restaurant next door called 5KU bar or something and it was super cool. Definitely recommend. No elevator. Good breakfast. Laundry didn’t smell the freshest after having it done. Mixed dorm is STAFF SLEEPING QUARTERS. We went to sleep (they came and shut off our lights) and multiple staff members tried to “sneak in” later - there were more staff sleeping in the room than guests. They wouldn’t let us lock the room because out “guests” were staying in the room, but in reality we were the only guests...Great hostel, really nice people, incredibly comfortable beds, amazing location and super helpful with tours BUT I would only stay again in a private room. Good stay overall. Clothes came back damp from wash. Room clean and staff will always help you if you need anything. Really good location. The hostel overall was clean and the beds were very comfy! however the staff’s English wasn’t great so we weren’t able to book a taxi to the airport at 4am, had to pull one off the street! The WiFi didn’t work in the beds which wasn’t great! Also, we were on the bottom floor dorm and our bathroom was used as a communal bathroom so we had strangers in and out the room all the time. Staff was nice. The ac in the room worked well, which is important. Location was good, close to the center, but quiet. The rooftop was lovely. My room was small for the amount of beads. The bathroom was always wet and packed toilet paper. The room was ok interns of cleanliness and space. However this hostel has 0 atmosphere, it has a lot of double rooms and only one form for 6 people. When there's free beds the staff uses them at night and they're getting in and out of the room and the toilet all the time as they do shifts. This is really unprofessional and they don't let you rest.